Hosting a “Frozen” Themed Party! 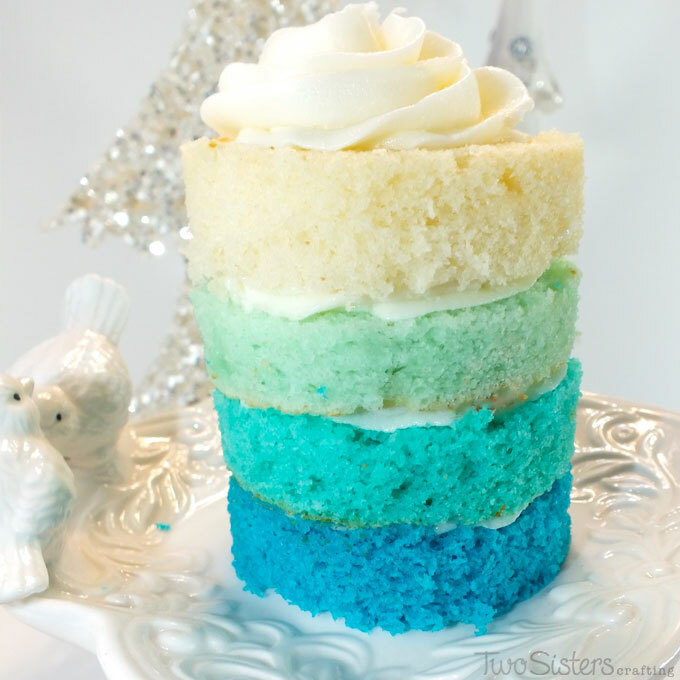 Disney Frozen Ombre Mini Cakes – We made these gorgeous Ombre Mini Cakes for a Frozen Party and they were a huge hit with our guests and you’ll find all the step-by-step directions here. 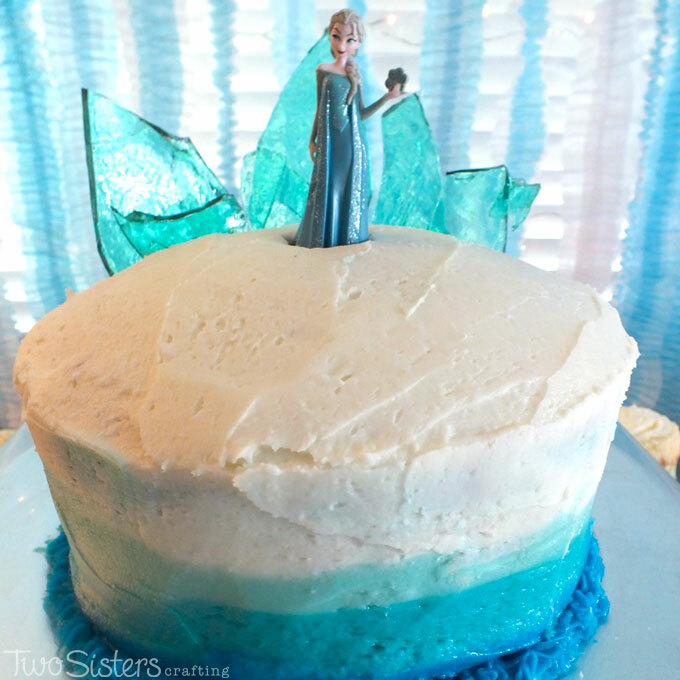 Disney Frozen Birthday Cake with Ombre Frosting – We love the way our ombre Disney Frozen Birthday Cake turned out and the birthday girl loved the hard candy frozen fractal ice castle decoration on the top. 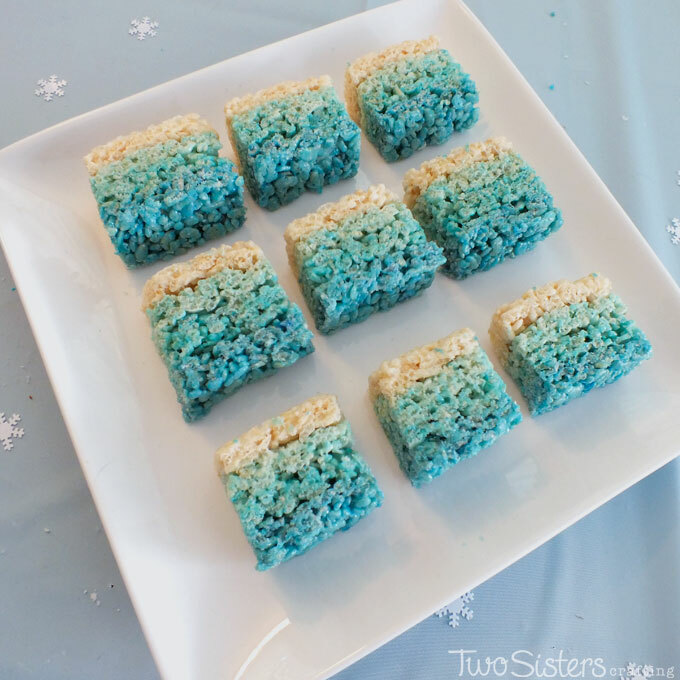 Disney Frozen Ombre Rice Krispie Treats – These Disney Frozen Ombre Rice Krispie Treats are both delicious, beautiful and easy to make. They were one of the highlights of our Frozen Dessert Table. 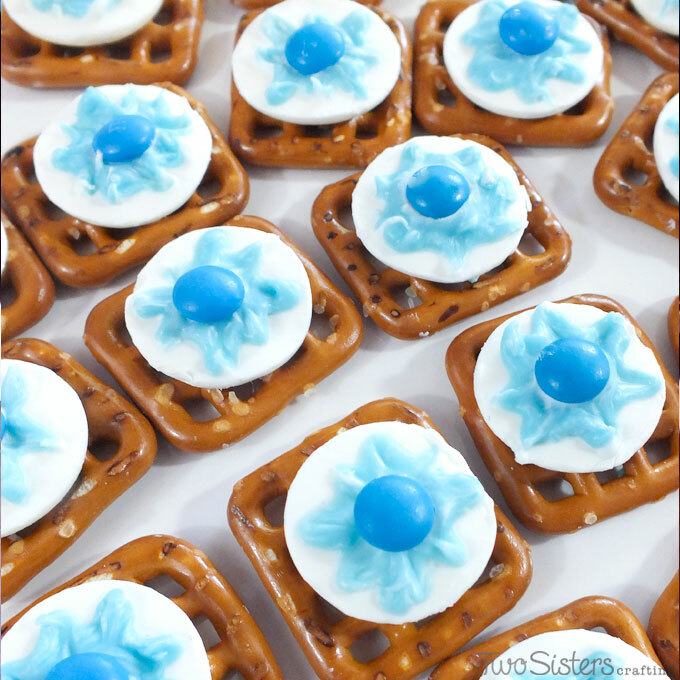 Disney Frozen Snowflake Pretzel Bites – We made these Snowflake Pretzel Bites for a Disney Frozen Birthday Party and these sweet and salty treats were a popular addition to our dessert table. 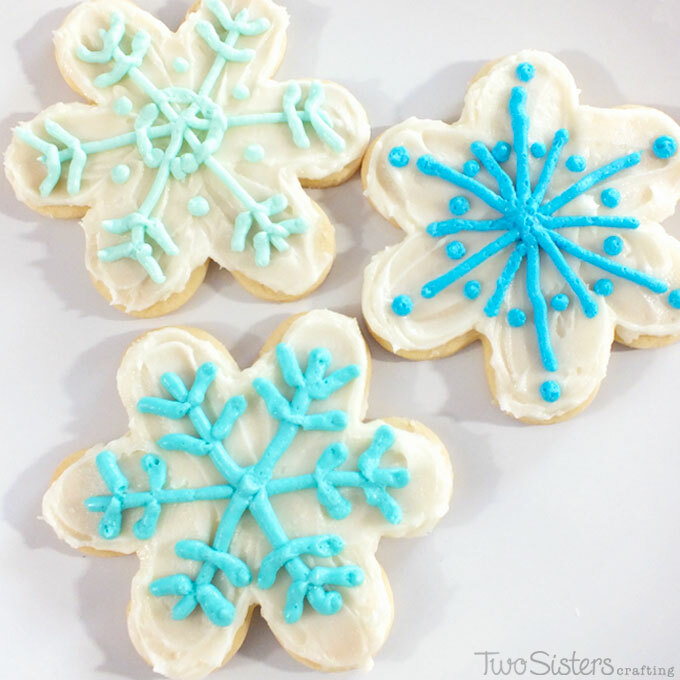 Disney Frozen Snowflake Sugar Cookies – These Frozen Snowflake Cookies were a popular treat on our Frozen Dessert Table and made with our excellent sugar cookie and buttercream frosting recipes. 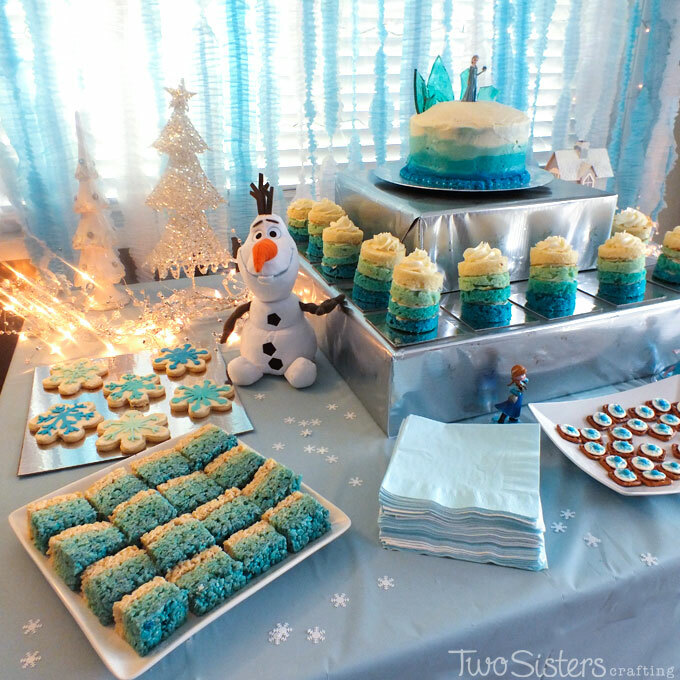 Disney Frozen Dessert Table – Our Frozen Dessert Table was both filled with yummy Frozen-themed sweets for our Frozen Party guests and also a sparkling and spectacular party decoration. 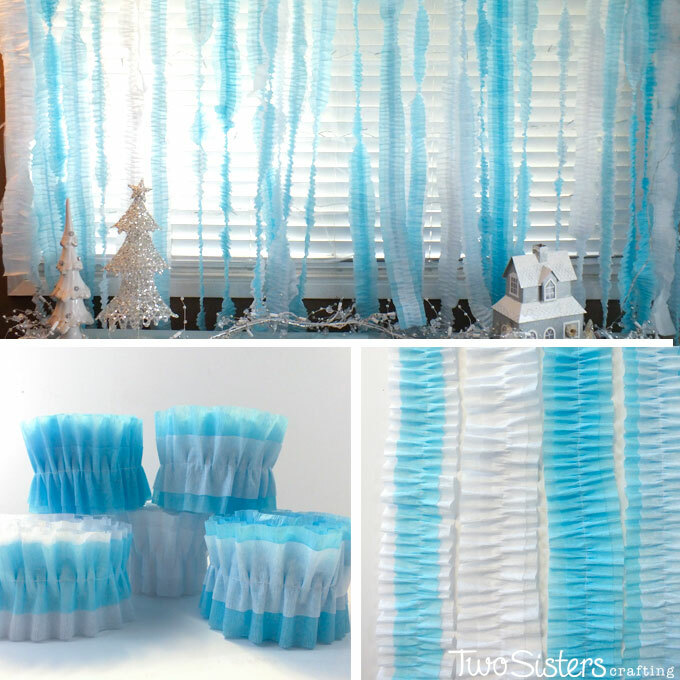 Disney Frozen Party Ruffled Streamers – Take crepe paper streamers up a notch by creating these Disney Frozen DIY Ruffled Streamers – all you need are crepe paper streamers and a sewing machine. Disney Frozen Party Balloon Decorations – Balloon Decorations from our Frozen Birthday Party. 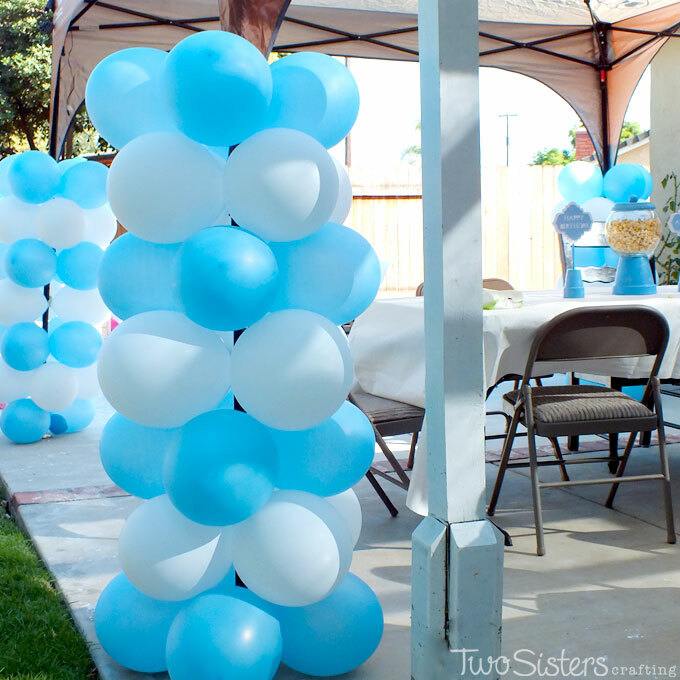 We have step by step directions on how to create these easy to make balloon columns and balloon banner. 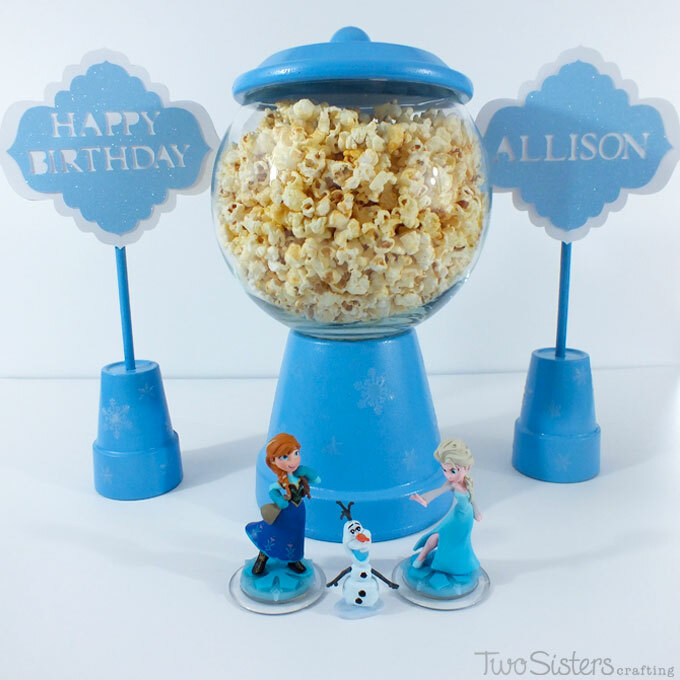 Disney Frozen Party Centerpieces – We made these Bubble Gum Machine style Disney Frozen Centerpieces for our Frozen Birthday Party and filled them with popcorn – they were a big hit! 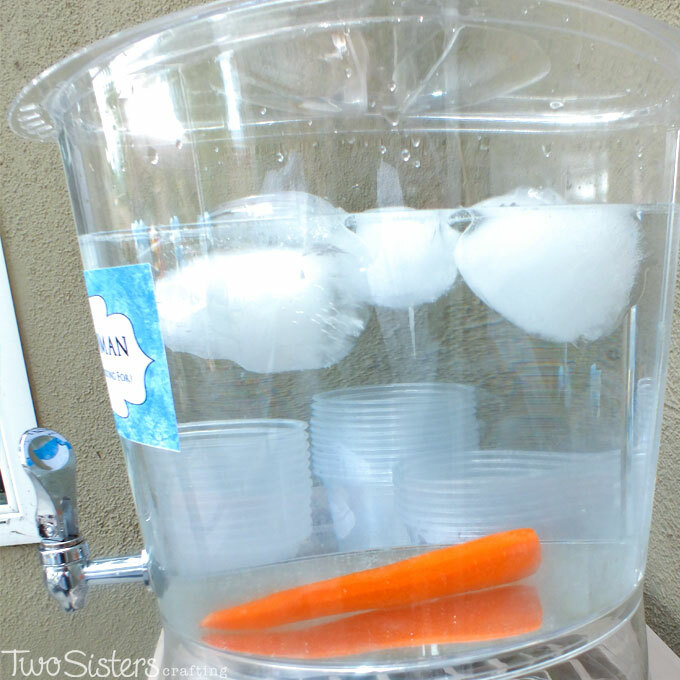 Frozen Melted Snowman Water Station – These Frozen Melted Snowman Water Station complete with carrot nose was a fun addition to our Frozen Birthday Party. Some parties ARE worth melting for! 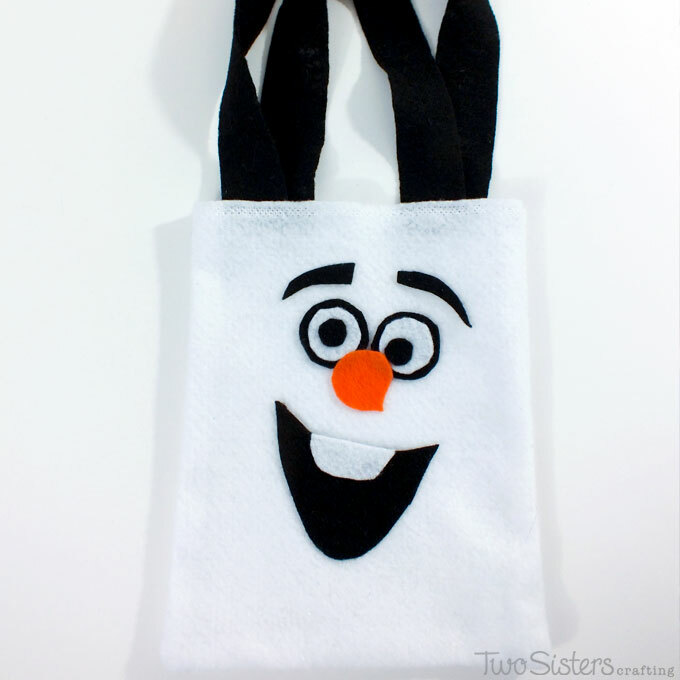 Disney Frozen Olaf Party Favor Bag – We made these Olaf Party Favor Bags for the boys at our Frozen Birthday Party. They were so cute and easy to make. 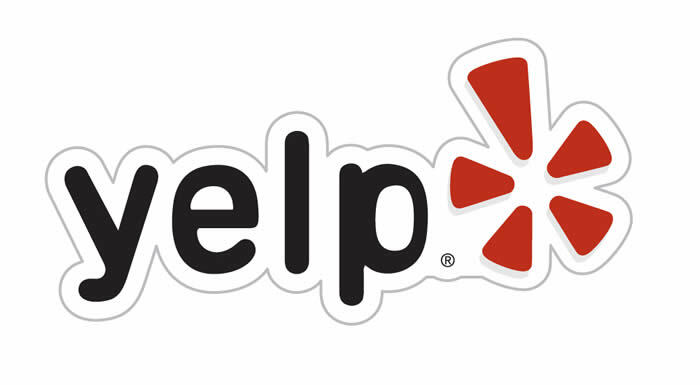 You could even create a no-sew version. 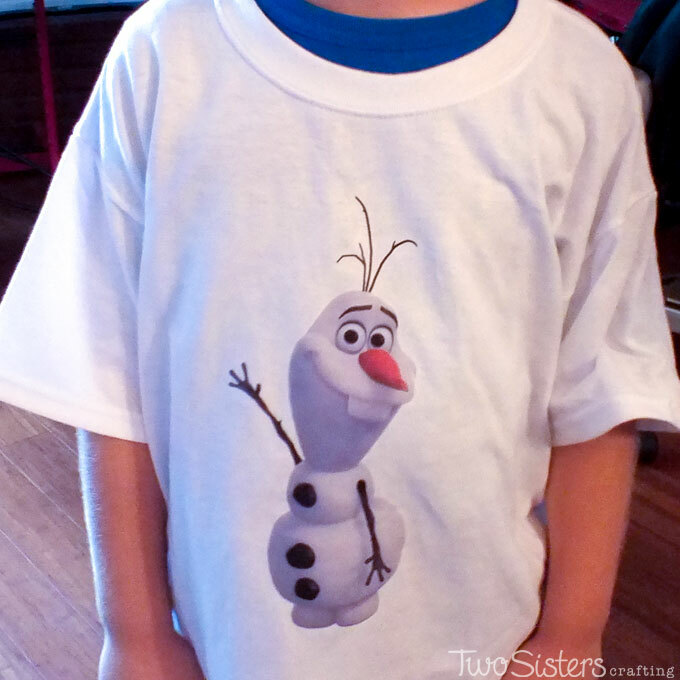 Disney Frozen Olaf Shirt Party Favor – We made this DIY Olaf Shirt as a party favor for the boys at our Frozen Birthday Party using inexpensive white t-shirts and an iron-on transfer sheet. 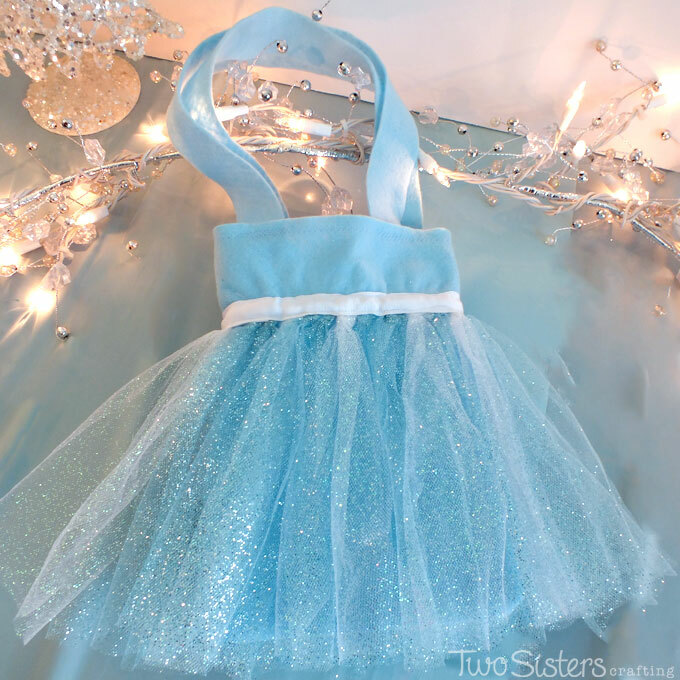 Disney Frozen Elsa Party Favor Bags – These Elsa Party Favor Bags are our favorite Frozen Birthday craft. Fit for an ice queen and sparkly enough for a young girl they were the hit of the party. 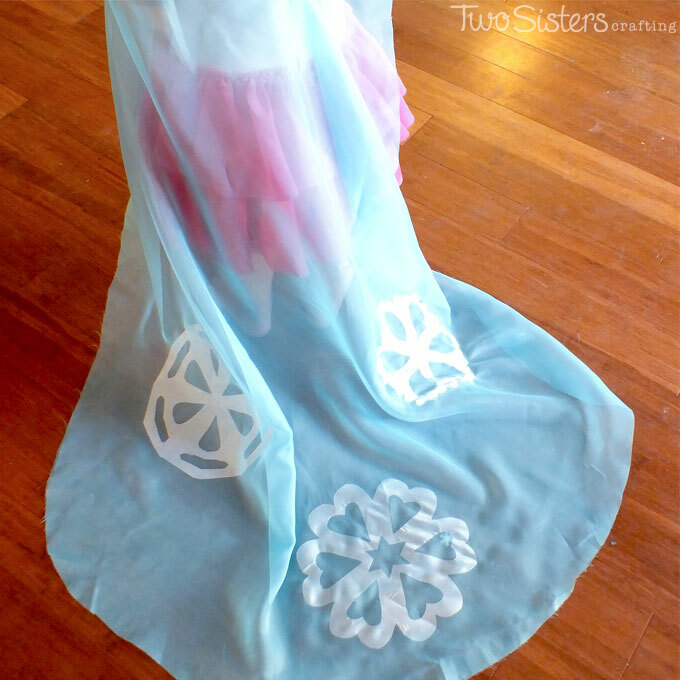 Disney Frozen Elsa Capes – These adorable capes were the hit of our Frozen Party and we have all the detailed directions for making No-Sew DIY Elsa Capes for party favors at a Frozen Birthday Party. 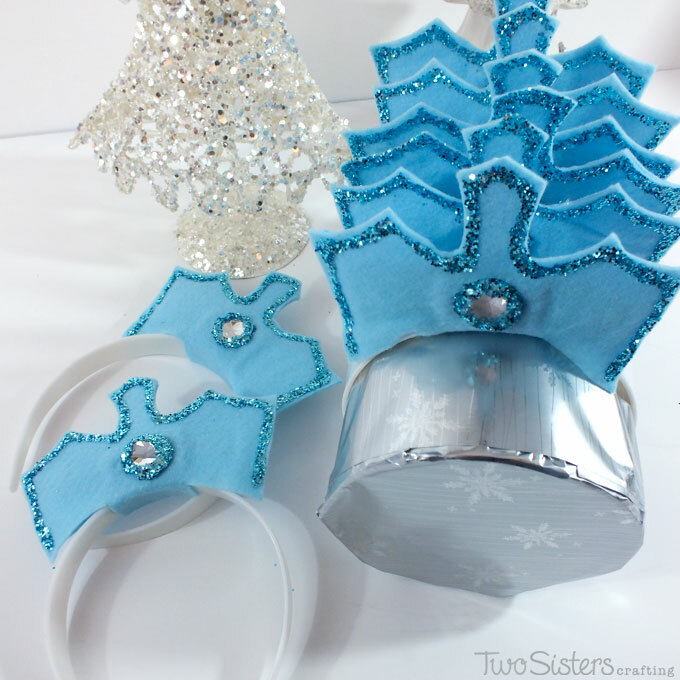 Disney Frozen Elsa Crowns – These DIY Frozen Elsa Crowns are easy to make and will make a great party favor for the girls at your Disney Frozen Birthday Party. 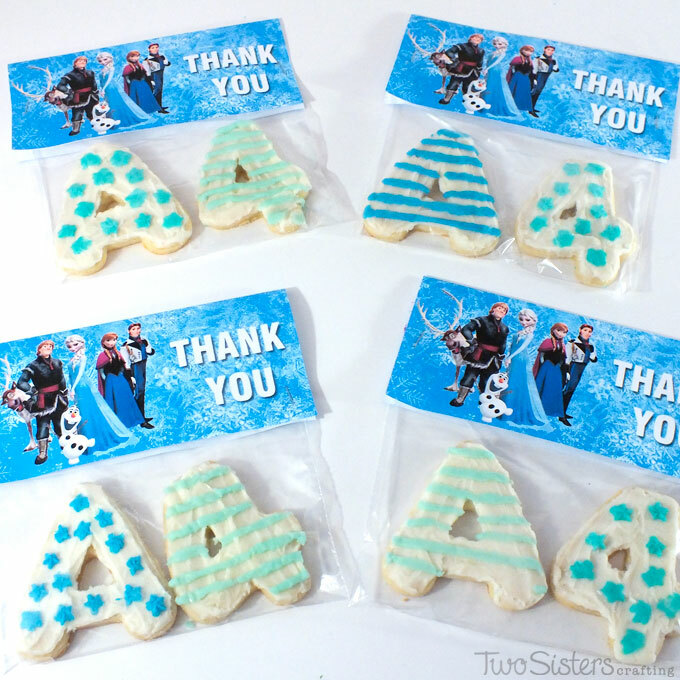 Disney Frozen Thank You Cookies – Step by step directions for making Thank You Cookies for a Frozen Birthday Party using homemade sugar cookies and buttercream frosting. 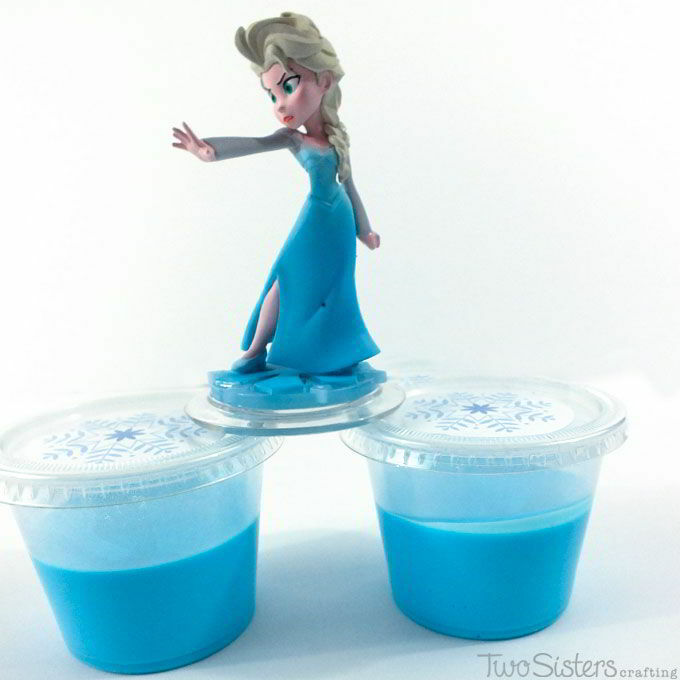 Disney Frozen Troll Slime Party Favor – Frozen Troll Slime is homemade Gak, It is super easy to make and is a great Frozen Birthday party favor or party activity and we have the directions here. 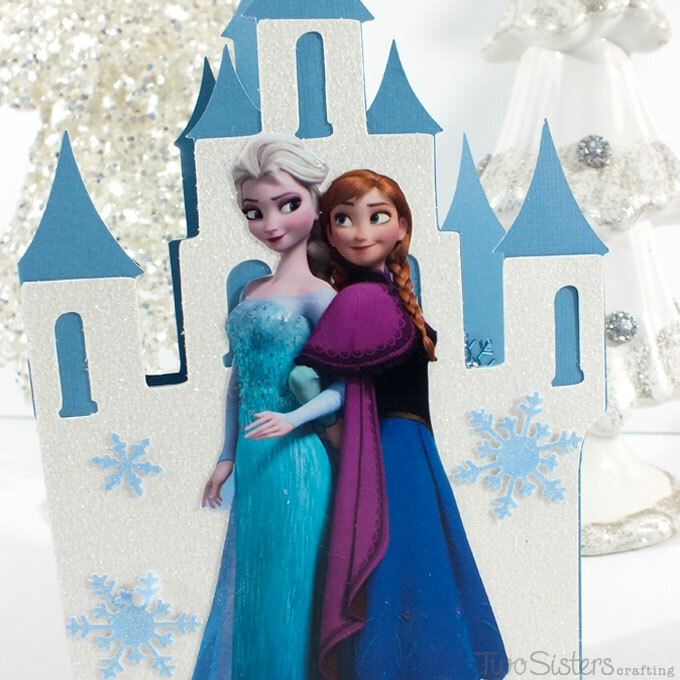 Disney Frozen Invitations – We made these adorable DIY Disney Frozen Invitations with a Cricut Cutting Machine, scrapbooking paper and print-outs of Disney Frozen characters. 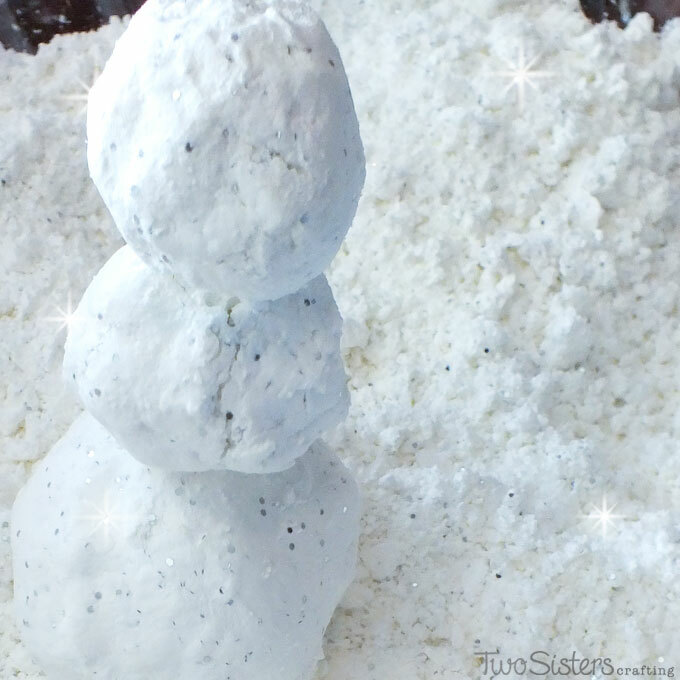 Disney Frozen DIY Play Snow – This DIY Play Snow was the hit of our summertime Disney Frozen Party. It’s so easy to make and felt just like snow. 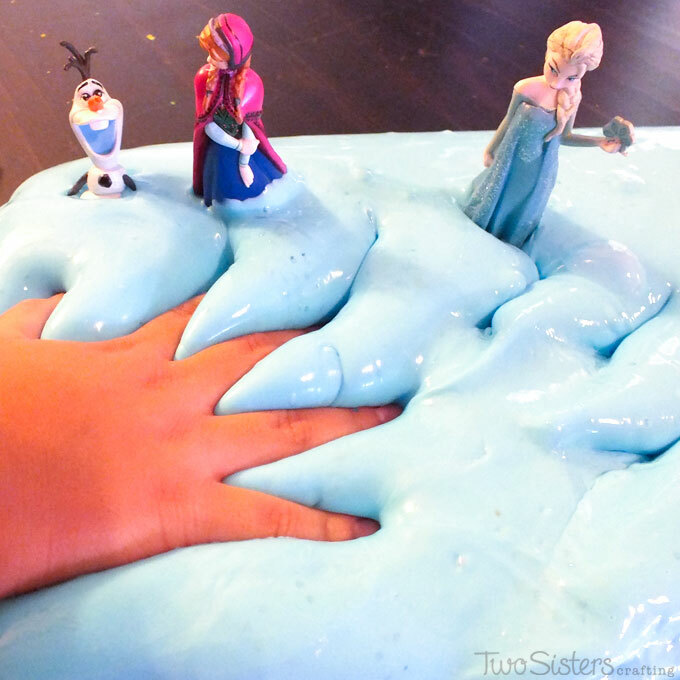 Disney Frozen Troll Slime Activity – Frozen Troll Slime is homemade Gak, It is super easy to make and is a great Frozen Birthday party favor or party activity and we have the directions here. 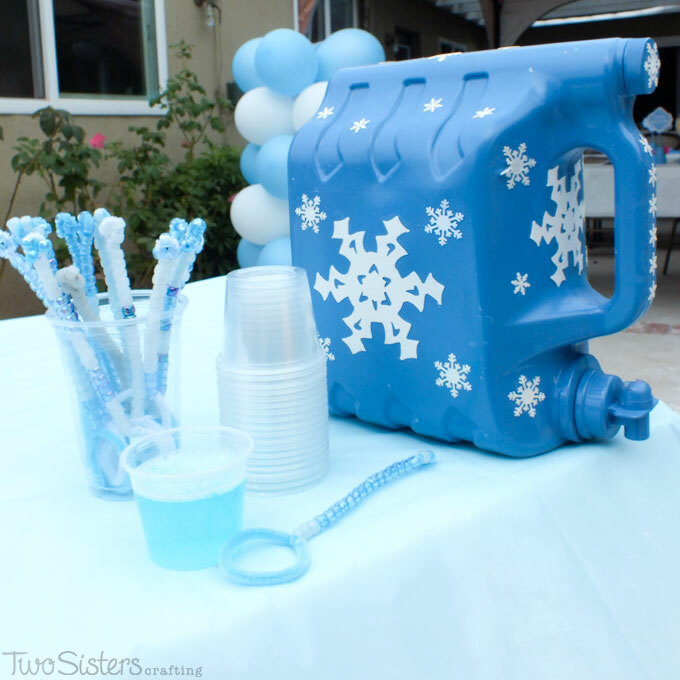 Disney Frozen Party Bubble Station – This Frozen DIY Bubble Station is a great activity for an summertime outdoor Frozen birthday party. Kids can use the Bubble Dispenser to get their own DIY bubble solution and make as many Elsa Snow Bubbles as their heart desires! 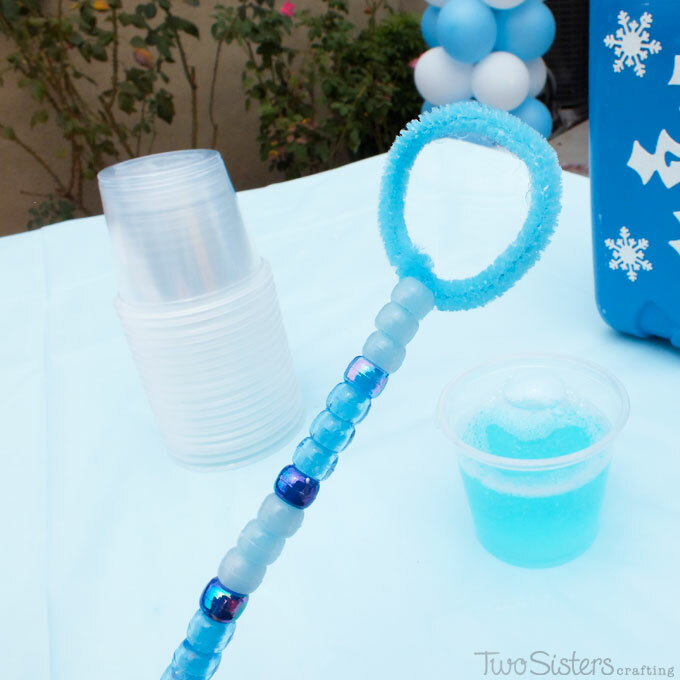 Disney Frozen DIY Bubble Wands – We made these DIY Bubble Wands with pipe cleaners and plastic beads for our Disney Frozen Party Bubble Station – an easy party craft with a big impact. 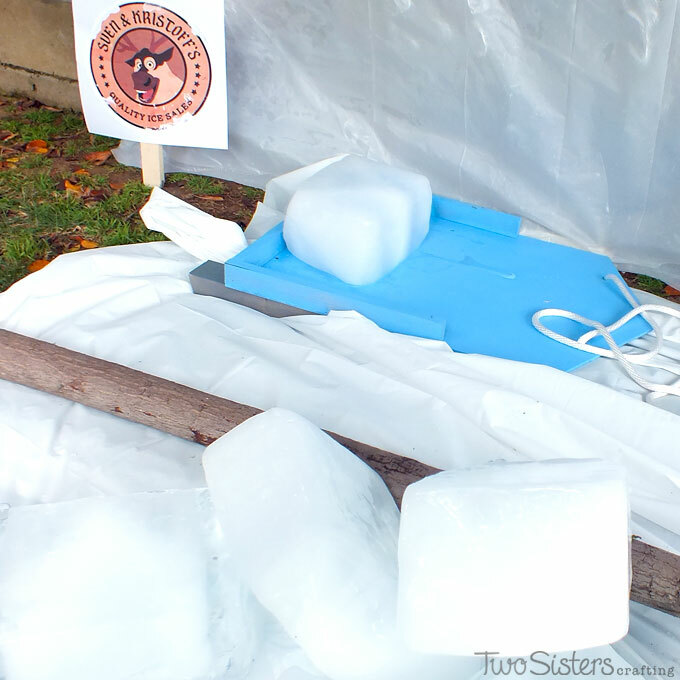 Disney Frozen DIY Sleds for Ice Block Races – These Disney Frozen DIY Sleds for Ice Block Races were a huge hit with the boys and girls at our Frozen Birthday Party and we have all the directions here. 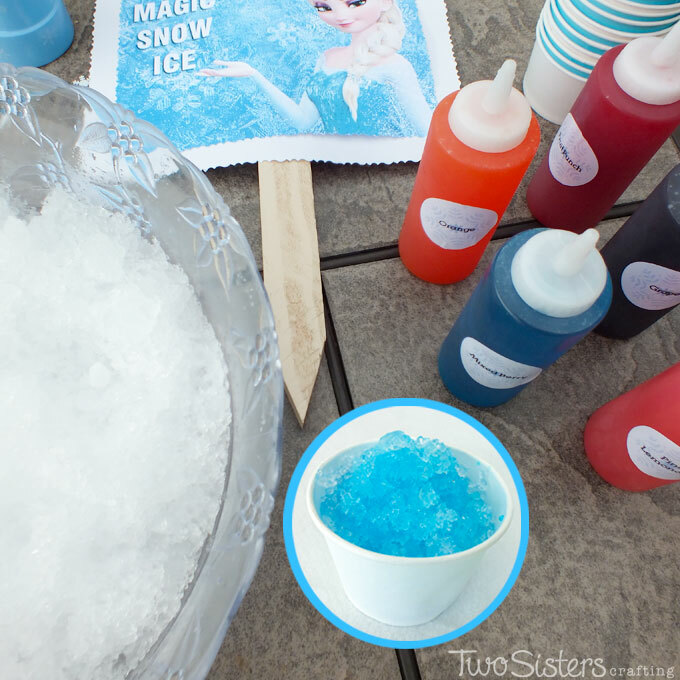 Frozen Homemade Snow Cones and Syrup – We made Homemade Snow Cones and Syrup as a special treat for the kids at a Frozen Birthday Party and we have all the directions right here. 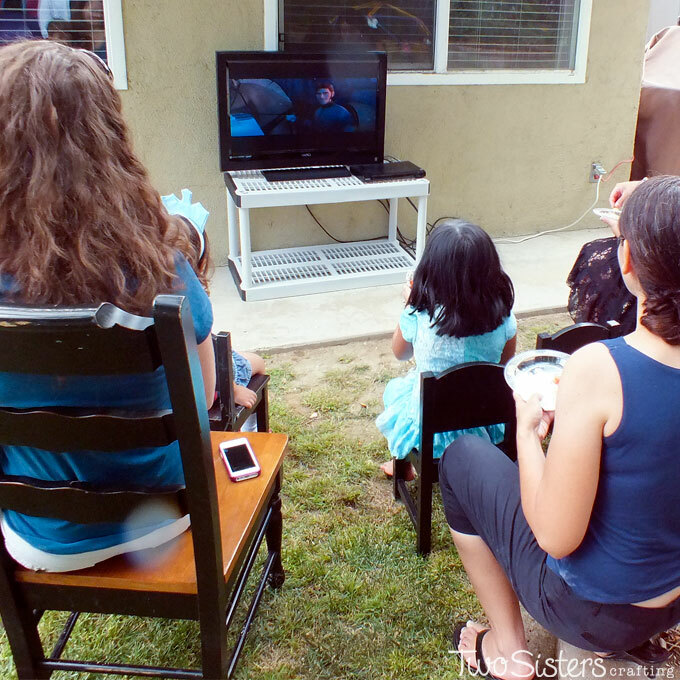 Disney Frozen Movie Watching Station – Need a fun activity for your Disney Frozen Party? Create a Frozen Party Movie Watching Station where party guests can enjoy Frozen throughout the party.